Holds 350 Gallons, customer is responsible for filling and draining. It takes approximately 2 hours to fill and 20-30 mintes to drain. Weight limit for seat is 250 lbs. Takes a 2" ball to tow. Allow 64 inches wide for any gates. 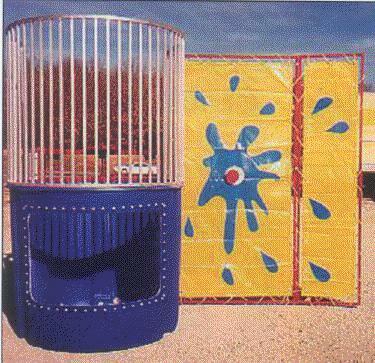 * Please call us with any questions about our dunk booth with window serving Cary NC and Raleigh NC, Chapel Hill, Pittsboro, RTC & Raleigh-Durham in North Carolina.